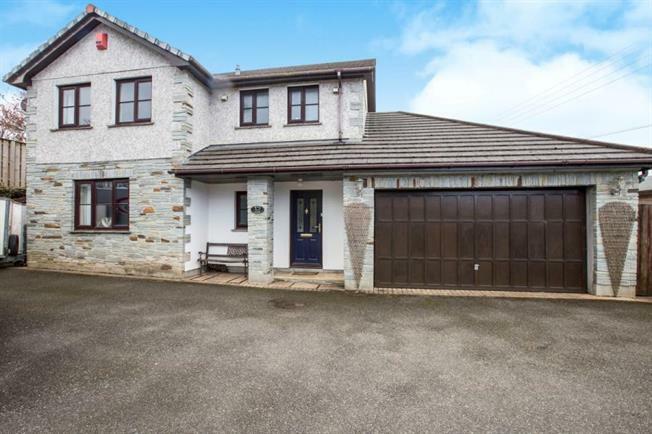 3 Bedroom Detached House For Sale in Redruth for £350,000. A very well presented three bedroom detached house located in Gilberts Coombe with a lovely enclosed garden, double garage and a detached workshop/garage and parking for several cars. The accommodation is laid out over two floors comprising large spacious family rooms including a sitting room opening to a conservatory, good size kitchen, large utility room and cloakroom. There are three double bedrooms to the first floor with the master bedroom having an en suite. There is also a family bathroom. The property is approached via a driveway with an integral garage and an additional garage to the side. There is an attractive rear garden which is enclosed and laid to lawn. The property benefits from double glazing and oil fired central heating. Double glazed front door. Stairs leading to the first floor. Laminate flooring. Radiator. Doors to kitchen, sitting room, cloakroom. Double glazed window to the front. Fitted with a close coupled w.c, wash hand basin, pedestal wash hand basin. Laminate flooring. Lovely sitting room with double glazed window to the front. Fireplace with wood burner. Two radiators. Double doors opening to the conservatory. Door to kitchen. Double glazed windows and doors leading to the garden. Tiled flooring. Radiator. Fitted with a good range of farmhouse style wall and base units with roll top work surfaces incorporating a one and a half bowl sink unit and drainer. Space for a cooker. Double glazed window to the rear. Tiled flooring. Radiator. Door to utility room. A very large utility room with access to the rear garden and double glazed window. Fitted units and under counter space for washing machine and drier. Tiled splash backs. Combination boiler. Tiled flooring. Radiator. Door to garage. Loft access. Solid wood flooring. Cupboard with shelving. A lovely master bedroom with two double glazed windows to the front aspect. Solid wood flooring. Radiator. Door to the En Suite. Fitted with a shower cubicle, low level wc, pedestal wash hand basin. Solid wood flooring. Wall mounted heater. Tiled walls. Extractor fan. Two double glazed windows to the rear aspect. Solid wood flooring. Radiator. Fitted with a corner bath, pedestal wash hand basin and low level w.c. Radiator. Two double glazed windows to the front. Storage cupboard. Solid wood flooring. The property is approached via a large driveway with parking for several cars. There is access to the garage and a detached workshop/additional garage. There is a lovely garden to the rear that is enclosed and laid to lawn and enclosed by a Cornish stone wall. There is also a patio area and the garden is private and enclosed.